Banker to the Poor: Micro-Lending and the Battle Against World Poverty is an autobiography of 2006 Nobel Peace Prize Winner and Grameen Bank founder Muhammad Yunus. This book shares the details of Yunus' early life, moving into his college years, and into his years as a professor at Chittagong University. While a professor at Chittagong University, Yunus began to take notice of the extreme poverty of the villagers around him. In 1976, Yunus incorporated the help of Maimuna Begum to collect data of people in Jobra who were living in poverty. Most of these impoverished people would take a loan from moneylenders to buy some raw material, using that raw material to create some product, and then selling back the good to the moneylender to repay the loan, earning a very meager profit. One woman interviewed made no more than two cents per day creating bamboo stools using this system. The list Begum brought back to Yunus named 42 women who were living on credit of 856 taka. Sajeeb Ahmed Wazed, also known as Sajeeb Wazed Joy, is a Bangladeshi businessman and politician. He is a member of the Awami League and serves as Advisor to the Government of Bangladesh on Information and Communication Technology. Nagorik Shakti or Citizens' Power was a proposed political party in Bangladesh. It was conceived by 2006 Nobel Peace Prize winner Muhammad Yunus. Yunus communicated his ideas to the people of the nation and asked for feedbacks by writing a total of three letters addressed to the citizens in the prominent national daily The Daily Star. Yunus discontinued his venture in 2007 citing lack of interested eligible candidates. Solidarity lending is a lending practice where small groups borrow collectively and group members encourage one another to repay. It is an important building block of microfinance. 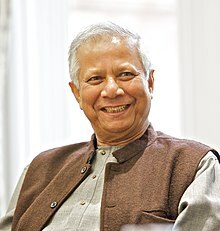 The Grameen family of organizations has grown beyond Grameen Bank into a multi-faceted group of profitable and non-profit ventures, established by Muhammad Yunus, the Nobel Peace Prize winning founder of Grameen Bank. Most of these organizations have central offices at the Grameen Bank Complex in Mirpur, Dhaka, Bangladesh. The Grameen Bank started to diversify in the late 1980s when it started attending to unutilized or underutilized fishing ponds, as well as irrigation pumps like deep tubewells. In 1989, these diversified interests started growing into separate organizations, as the fisheries project became Grameen Fisheries Foundation and the irrigation project became Grameen Krishi Foundation. The Yunus Centre, in Dhaka, Bangladesh is a think tank for issues related to social business, working in the field of poverty alleviation and sustainability. It is 'aimed primarily at promoting and disseminating Professor Yunus’ philosophy, with a special focus on social business' and currently chaired by Prof. Muhammad Yunus. Its Executive Director is Ms. Lamiya Morshed. "Hear Me Now" (2006) is the first single by European band The Green Children. As with their previous albums, a percentage of the proceeds were donated to The Green Children Foundation, their charity, which benefits orphaned children and animals in need.